Time for another star project. This one is going to be a bit different from the last 3. I am going to make at least one 3oz, 4oz, and 5oz star. These will be auctioned off at the event below. 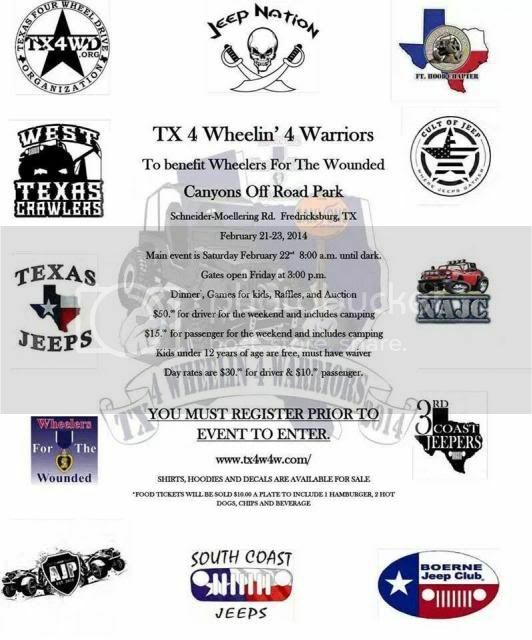 Stouttrout wrote: February 25, Texas 4x4 clubs will be hosting a fundraiser for WFTW. This will be held at Canyons Offroad in Fredricksburg, Texas. There are plenty of product for the event that anyone can purchase and if anyone would like to donate and item to the Live Auction. Please let me know. These will not be personalized with the silver donors stamps, but they will have the same front stamping as the other stars in the past. If we can get donations for more than 12oz to cover the 3 stars, i'll make others to be auctioned off here at BS. Post in this thread or PM me, MaxGravy, or Blue Angel if you'd like to donate. I will also be offering to use my silver shot for anyone that would like to donate cash instead of sending an ounce or two. Price will be spot +50c (what i pay at provident). Thank you for your support of WFTW, it is greatly appreciated. Blue Angel wrote: Here's the flyer for the Fundraiser. Probably going to be one of the largest gathering of 4x4's in Texas EVER. 1 oz shot. More later if needed. I'm up for an ounce of your shot...so $20.77 or do I wait for instructions? I'll cover an ounce as well. If I can by some Ag shot from David; I am in for 43 bucks via check. or about two ozs. I will donate an ounce. I have enough in my PP account to cover an ounce. Can I do it with PPG? If so somebody send me a PM and let me know where to send it. Put me down for another 1/2oz to make an even number. Is anyone planning on attending this event? DRP270 wrote: Is anyone planning on attending this event? I may make it.....about 75% chance at this point. Stouttrout will definitely be there. Anyone else? Getting ready to wrap this one up. Thank you to all those that donated. I've sent a 3, 4, and 5oz to Stouttrout to be auctioned off at the event. I have 6oz of silver left over, so i will be making 2 x3oz stars to be auctioned off in the next KSA. Silver Addict wrote: Thank you to all those that donated. I've sent a 3, 4, and 5oz to Stouttrout to be auctioned off at the event. I have 6oz of silver left over, so i will be making 2 x3oz stars to be auctioned off in the next KSA. Good on ya David Your finished products always looks great and should bring a nice donation to a worthy cause ! !